Our local botanical garden has a butterfly pavilion that opens in early May. In anticipation of a field trip with my grandsons to this event, I planned a unit of study on butterflies. After ordering several books from the local library, I created some lesson plans that I will share with you in this post. As always, I planned a variety of lessons in each intelligence to have differentiated activities for each grandson: Tigger (7), Kona (5), and Tahoe (who just turned 4 in the middle of this unit). I have more time with Tahoe, since his brothers go to a charter school, so he did more activities than his brothers in this unit. I had planned to spend three weeks on this unit of study, but it has been two months and we are still in the middle of this study unit because there were so many activities that I wanted to complete with them (and the books were so good, too). When using a study unit, I want the grands to complete at least one activity for each intelligence. 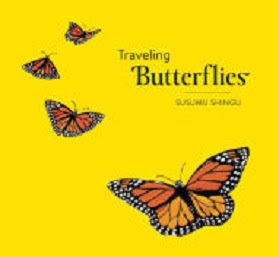 Traveling Butterflies by Susumu Shingu is a great introductory book to explain the life cycle and migration of monarch butterflies. Besides the simple explanations in the book, the illustrations are gorgeous. This was an especially good book for Tahoe. Discussion Focus: Sequencing-This was the main book I used to explain the sequence of events in the life cycle of butterflies. All the grands could tell me the sequence of events after reading this book to them several times. 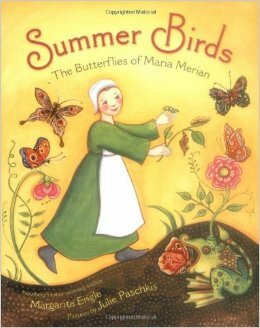 Summer Birds: The Butterflies of Maria Merian by Margarita Engle tells the story of a seventeenth century girl who became a famous scientist, artist, and explorer. The book explains how by careful observation, Maria Merian discovered that metamorphosis was a natural process, and that insects did not spring forth “spontaneously” from mud. Discussion Focus: Fact and Fiction-Because this book explains how Maria Merian used observation to uncover the natural process of metamorphosis, it is a good book to use to explain the difference between facts (which can be proved somehow) and fiction (which is an imagined creation). 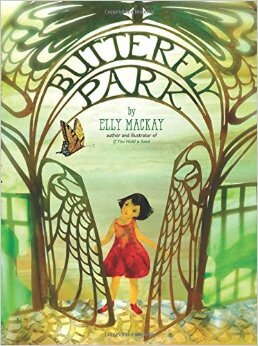 Butterfly Park by Elly MacKay is a beautiful story of a little girl who moves to a new town and brings a community together as they revitalize a butterfly park. The paper-cut illustrations are remarkable in this book! Discussion Focus: Identifying Main Ideas Themes: Children need lots and lots of examples of the thinking process involved in identifying the main idea of a story (what the story is mostly about) and theme (the underlying message). This is a good book to use as you model how you use details in the story to uncover both the main idea and the theme. 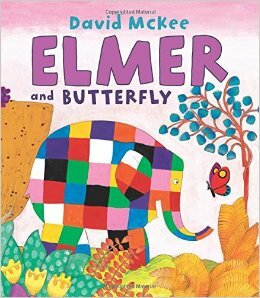 Elmer and Butterfly by David McKee is a cute fictional story of an elephant and a butterfly who help each other out of dangerous situations. This is a great book for preschoolers, including Tahoe, aged 4. Discussion Focus: Story Elements-I used this book to practice identifying main characters, setting, problem, and solution with the grands. For Tahoe, (4), I modeled my thought process in identifying these story elements. Kona and Tahoe were able to identify the story elements with just a little discussion reminding them how to find the problem and solution. 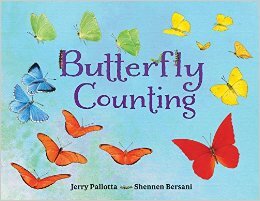 Butterfly Counting by Jerry Pallotta and Shennen Bersani is not only a counting book (using numbers 0 to 25), but it includes information on a variety of butterflies and offers the word “butterfly” in different languages. The illustrations in this book are absolutely magnificent as well. What’s the Difference? 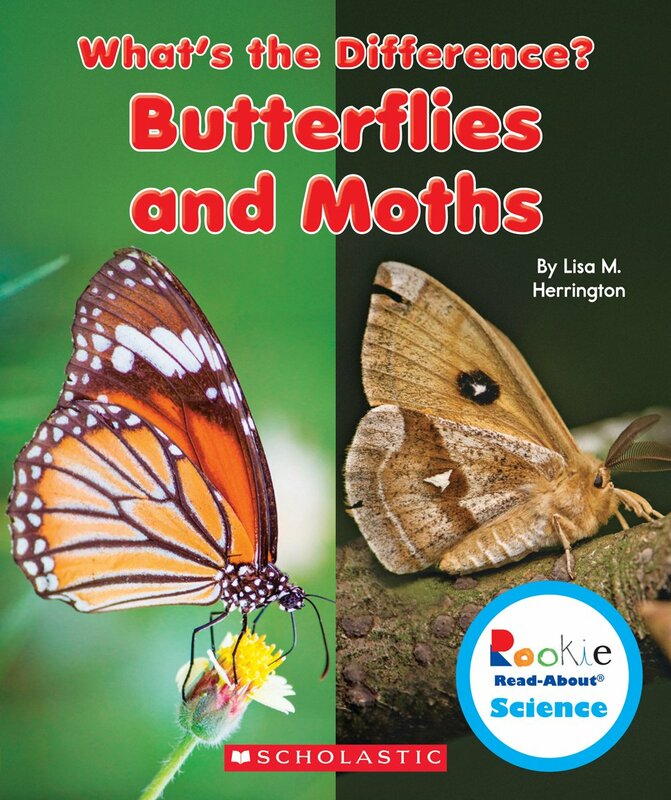 Butterflies and Moths by Lisa M. Herrington is a terrific non-fiction book for the early grades that explains the differences between moths and butterflies. Discussion Focus: Glossary and Sight Words-Since Tigger (7) has pretty much mastered sight words, we discussed how to use the glossary at the back of the book. We looked in the glossary to see if the words he didn’t understand could be found there. I had Kona (5) pick a a page and tell me all the sight words he knew (he knows about 50 now). For Tahoe (4) I showed him the word “butterfly” when we came across it in the book. 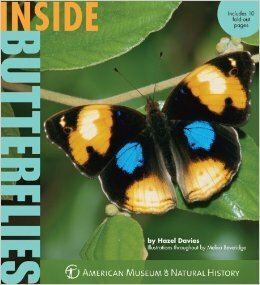 Inside Butterflies by Hazel Davies is a book that I should just buy for the grands because there is so much information in it. This book includes information on butterfly senses, the life cycle, eating habits, defense systems, camouflage, silk, migration and several other topics. Each page unfolds with more beautiful photographs, illustrations, and facts. There is also a table of contents and glossary in this book. 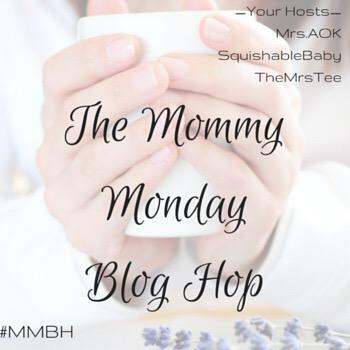 Discussion Focus: Table of Contents-There is a lot to read in this book, so I had Kona and Tigger use the Table of Contents to pick a topic to read and we just focused on that page each day. I used the Butterfly Counting book with Tahoe to practice his counting up to 25. (He is getting pretty good at counting objects up to 30 at the moment.) With Kona, he chose two pages and I had him add the numbers of butterflies on those pages. This way, if he needed “counters” to do the addition, he could count all the butterflies on the two pages. Create math problems with butterfly themes such as: Three Monarch butterflies landed on the milkweed plants in the backyard. Each butterfly laid five eggs. How many eggs in all were placed on the milkweed plants by the butterflies? 1-2-3-4, first there is an egg. 1-2-3-4, it makes a chrysalis. The cycle starts over again, the butterfly lays eggs. Other songs: The older grands enjoyed the rap song “Butterfly, Butterfly” which I found online from Harry Kindergarten Music. Classical Music: These pieces are inspired by the butterfly: Moritz Rosenthal – Papillons and Edvard Grieg – Schmetterling, Op. 43/1. I played these pieces for the grands as they worked on their art projects. I purchased a kit to so the grands could watch real caterpillars eat and grow, form a chrysalis, and transform into butterflies. We are still in the middle of this project, and the grands are so excited to check the cup where the caterpillars are growing throughout the day. Their caterpillars are nearing the pupa stage, where they will each become wrapped into a chrysalis. Update: All five caterpillars formed a chrysalis and 7 days later we had five butterflies. The grands are enjoying them for a few more days before we release them in the backyard where their mom has planted some milkweed and cosmos for these butterflies and their potential offspring. Walk around your neighborhood and see if you can find butterflies. To encourage butterflies in your backyard, add plants to your garden that attract the local butterflies. I am going to have the grands plant some varieties for the Painted Ladies butterfly which are the type of butterfly that will emerge from the caterpillars I purchased in the kit. Visit butterfly pavilions in your area. Often they are offered seasonally at local botanical gardens, zoos, and natural history museums. Our local botanical garden offers a butterfly pavilion from mid-May through mid-August. This is the field trip that we have yet to do, but will be the culminating activity of this study unit. Craft projects: The grands love to do art projects, so I always have lots of activities in this intelligence. Tahoe completed two of these projects. For the first one, I drew a leaf on some green construction paper for Tahoe. He cut it out himself. Then I had him make small balls from PlayDough to represent the eggs that will eventually hatch and become the butterfly. For the second leaf and egg activity, I cut out a leaf pattern from white construction paper and had Tahoe use his green dot paints. When those were dry, he glued pom poms onto the painted leaf to represent the eggs. I helped Tahoe make a caterpillar out of an 8 ” length of ribbon, a milk bottle cap, strips of construction paper, googly eyes, glue, tape, and a permanent marker. Glue was not strong enough to keep the milk bottle cap on the ribbon, so I used tape. Tahoe used glue for all the googly eyes and construction paper. Since my grands love to use the circle punches I own, I use them in a lot of my craft projects. To make the butterfly, I drew the outline of a butterfly on a piece of manila construction paper. Then Tahoe was able to punch out his own circles from several different colors of construction paper and glue them inside the butterfly outline. Videos: I also showed short videos to the grands regarding the life cycle of the butterfly. Circle Storytelling: After the grands understand the life cycle of the butterfly, have them take turns explaining it in a story. This can be done as circle time, or around a meal. Start the story with, “One day I found some small eggs on the milkweed plants in the backyard.” Then have each child take their turn to add to the story. Dramatic play: The grands often use the topics we have been discussing in their “pretend” play, or dramatic play. One day I saw two of the grands playing together and using their toy cars and pretending that they were caterpillars and butterflies. Just watching them play together like this can tell me a lot about their understanding of this study unit. Discuss individually with each grand: What is your favorite part of the butterfly’s life cycle? Show (from our library books) or tell me which butterfly you like the best? I leave the library books in a convenient place for the grandsons so they can browse or read them on their own. We spend each spring learning about butterflies; reading books about butterflies and growing caterpillars. It’s such a fun “spring” thing! Yes, I think this is going to be an annual activity too. The grands’ caterpillars are now chyrsalides and it won’t be long before they emerge as butterflies. The grands are fascinated by this process and I know they will be happy to do this again. Thanks! I added the Practical Mondays Badge. 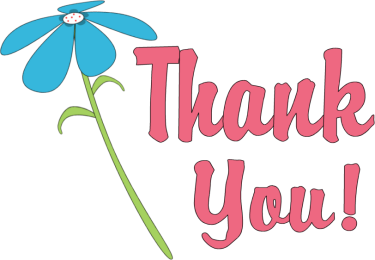 Thank you for hosting this link party! I’m so glad you stopped by neighbor. I’m loving the books you recommended! Adding them to our list now!